More and more info keeps appearing about the upcoming Hot Wheels line as more and more 2014 models are being found. And now we have another, and it is the fantastic Mazda RX-7 SA22C. She looks good, even without Japanese Nostalgic Car or JDM Legends logos on the side. They so need to bring back the Hakosuka dang it. I'll even take another Kenmeri too. I'm actually trying to purchase an SA22 GSL-SE, so I am super stoked to see this in the Hot Wheels lineup again. If this is anything like the previous releases it should still be on shelves by 2015, same with the Corolla. There isn't as much interest in these older Japanese cars as a vocal minority will have you believe. I have, as the moderator of the Lamley Group, always hated comments like these, whether aimed at Japanese cars or not. Every areas different. What is a pegwarmer in one area will fly off the shelves in another. I have been to stores where nothing but muscle cars hang forever, and I have been to places where the muscle is gone and euro and other import cars hang. Don't assume your little slice of the world represents the whole world. There are a lot of people excited about this model, and a lot who couldn't give two hoots. And guess what? That's pretty cool. So far, my favorite Japanese car is the civic. What a surprise in this mazda RX-7! This car has to be in my collection because its design is close to scion FR-S for 2013. Love that RX-7! The color and the graphics are pretty dope! Nice. The 2000GT is lovely, as always. Maybe not in your area. But down here in New Zealand the Jap cars fly off the shelves and are the most popular of the Hot Wheels range. I still want Hot Wheels to make an FD casting! 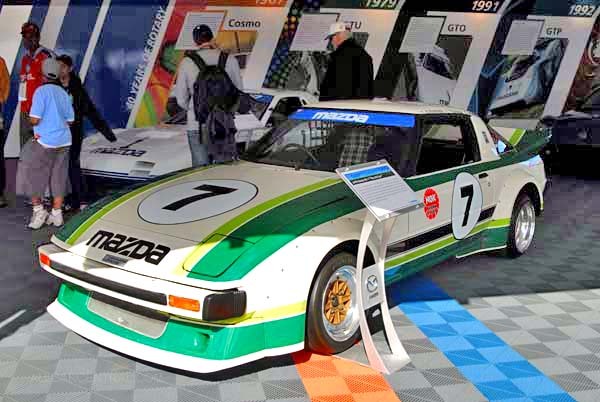 The car you are mentioning is the 1979 Mazda RX-7 24 Hrs of Daytona Winner. This two-toned green and white beauty would be AWESOME dressed up with this exact scheme. Hey .. even with the gold lace wheels, but that's optional. I really hope HW's does this and if they did, it would FLY off the shelves! It would be far better than the maroon model seen above. Damn straight. Is there going to be a 2014 hot wheels pagani zonda or it's coming out at 2015? Just found the 2013 TH yesterday, and this red one looks awesome. As for the love/hate for the JDM cars, even though i'm not a big fan of Japanese and Euro cars, I much prefer to see something new and different than the same old muscle car, mustang, Camaro, etc. cars that most every diecast collector in the US likes.